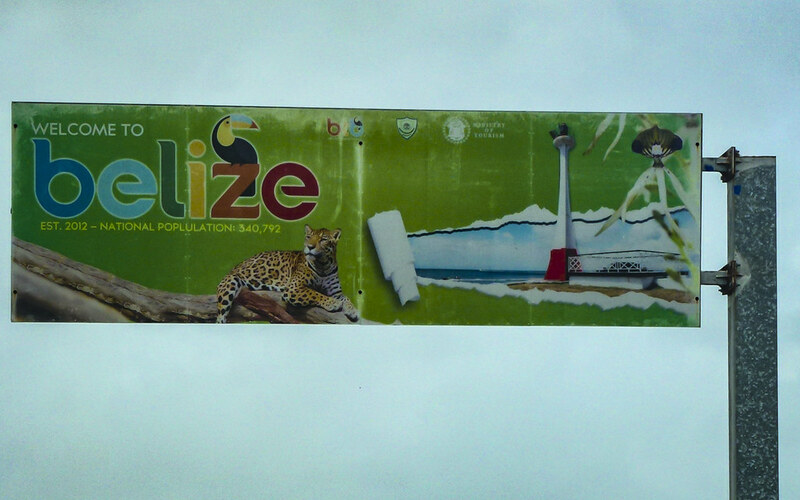 We greeted Belize, the smallest of the countries we’ve visited, and one we almost skipped, with mixed feelings. The first shock upon entering, after spending almost 1/2 a year in Mexico, was hearing English! I kept thinking this whole trip…when we leave Baja and get to mainland Mexico, I’m really going to have to learn more Spanish. But that never happened and I pushed the task to after we left Mexico, although my ear was getting used to Spanish. 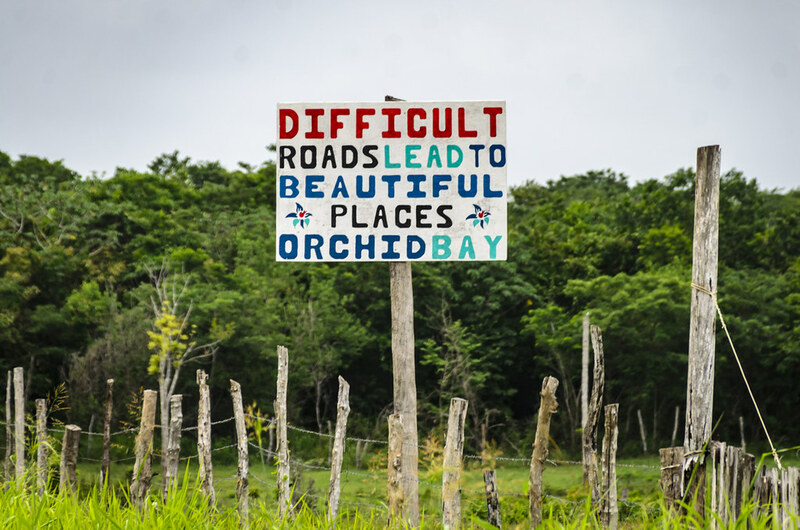 It felt like we were going backwards somehow to enter Belize and start using English on our way to Central America! The Border crossing was non-eventful, but I still wrote every little detail of the crossing down so that we could report on it for other travellers. That was a whole year ago now, so perhaps things have changed since then. This was going to be our act of service to others on this journey (seriously check out how detailed we got when Crossing into Mexico and when taking the Ferry to Mazatlan) We’ve long since stopped worrying about border crossings, except a quick read on the app iOverlander to check if insurance is needed, which currencies are accepted, and any recent notations. So I guess if this trip has morphed my personality in any way…I’m perhaps a little less type A, more like a B+ now. I still have those detailed notes, and I intend to post them yet. Along with note taking at this border, I was obsessed with what looked like a large Amish family also entering Belize. The women wore bonnets, and aprons over floral dresses, and the men were dressed in overalls and brimmed hats. Their presence turne the immigration building into a scene from Little House on the Prairie. I was thinking why on earth did this family travel all the way to Belize!!?? Being from Lancaster County Pennsylvania, I assumed they were Amish because of their clothing, but it turns out they were Mennonites, and that I was actually entering their home country! Mennonites, primarily from South Russia arrived in Belize around the 1950s via earlier settlements in Canada and Mexico. Similar to the Amish, they shun most modern technology and farm the land using time honoured methods, like plowing their field with animals. Some do use tractors now, but replace the rubber wheels with wooden wheels so they are not so pampered with too smooth of a ride. They are a very insular community, but contribute to the local economy with the production of milk, cheese, beans, corn, melons, honey, chicken, and eggs. 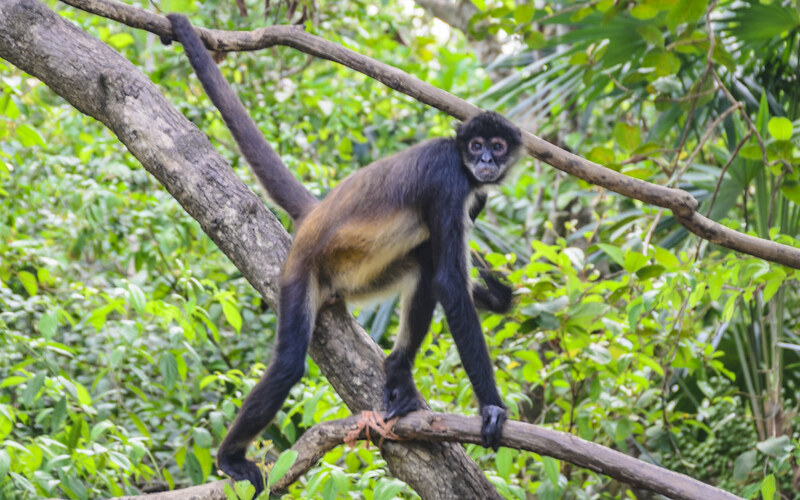 They have turned sections of the jungle into highly productive farmland, to the dismay of some conservationists. After our crossing we headed to a small town of Copper Bank, and were delighted to experience our first small mini adventure of traversing a river by way of a hand cranked ferry. The beautiful ferry crossing and a simple sign indicating lovely places ahead, warmed us to Belize immediately. But the warmth we felt for the country in that little experience quickly evaporated by the mosquito population at our first campsite. We stayed indoors, and didn’t even use the bathroom at night for which we paid extra, because each opening of our camper door invited a swarm of mosquitos into our living space. We would then spend the next 30 minutes on a killing rampage, making sure we got every last one of them. Then we switched our attention to mopping up the mosquito blood on the camper walls. We had to explain this to Indigo, who understood previously he was not to kill bugs of any kind, but to catch and release. Mosquitos are the exception to this rule, therefore making it a “real” rule. 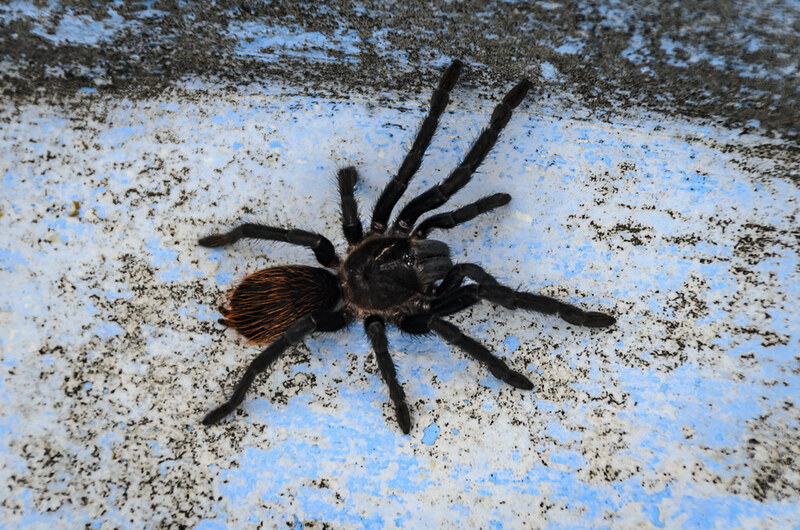 We did take a peek into the empty pool at the hotel, curious why it was drained and not in use….perhaps because it was home to this rather large tarantula? We got our grumpy selves back on the road and headed South. 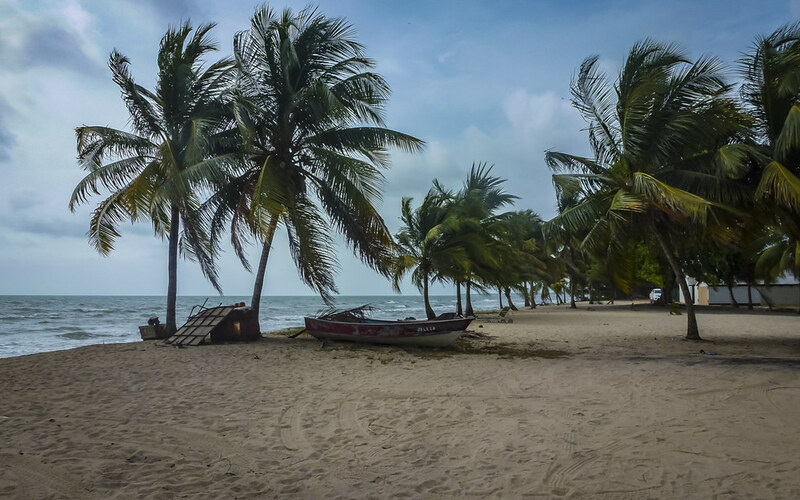 We were told that if you’re not spending much time in Belize, head south as there is not much in the North. Our friends ClunkMonkey would definitely disagree, as they planted themselves happily in the northern town of Orange Walk for a very long time. 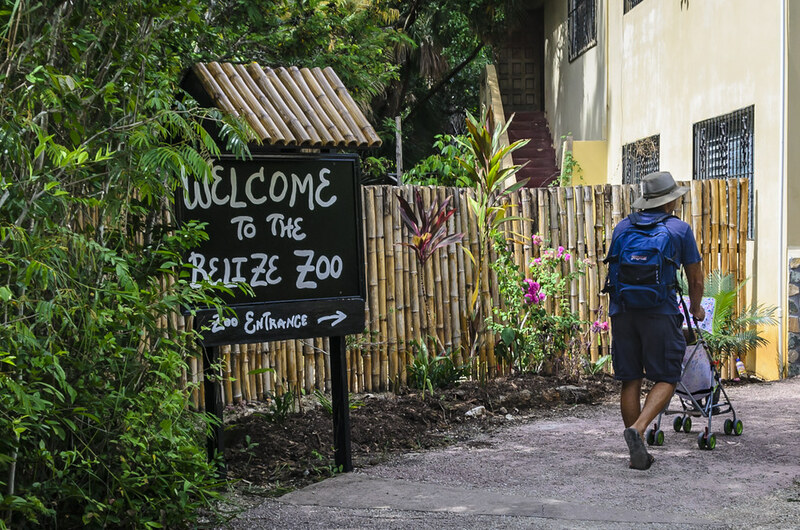 But we headed to the Belize’s Ecological Zoo, smack in the center of the small country. 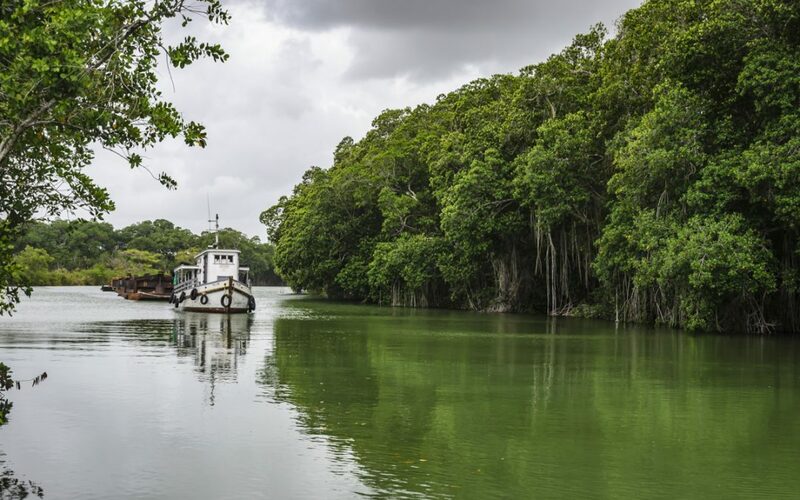 What a fantastic turning point for us…and for our perception of Belize! The zoo was a great experience for all of us, and we were impressed by the conservationism, and the education. 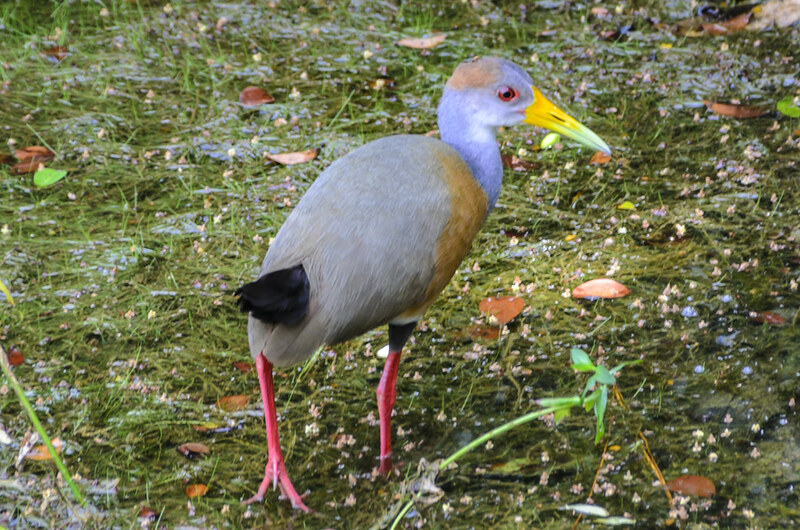 I am not a bird fan in general, but the huge array of large birds and owls at the zoo was impressive. I now fully believe one should see a Harpy Eagle in person at least once in your lifetime! Not one of our photos came out well, but for me standing next to Panama the Harpy Eagle was the highlight of the zoo. 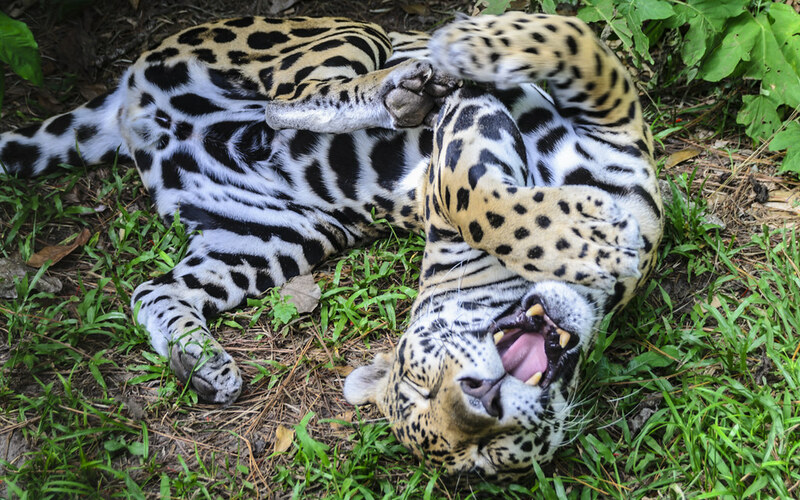 But the gorgeous jaguar rolling around in the grass was a very close second. 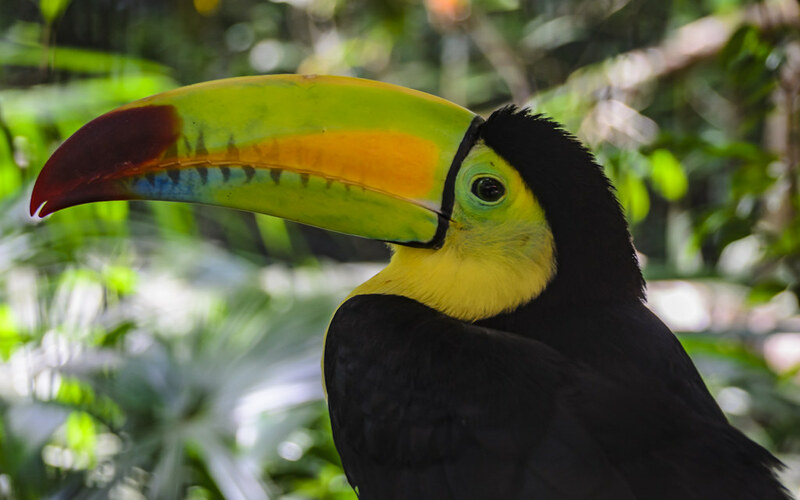 After visiting, we stayed at the Belize Tropical Education Center, which is an extension of the Belize Zoo. Students and travellers can stay in the lodge here or camp. Their program is known worldwide, and we met many people from other countries who traveled here for courses in eco tourism and conservation, from middle school students all the way to PhD students. 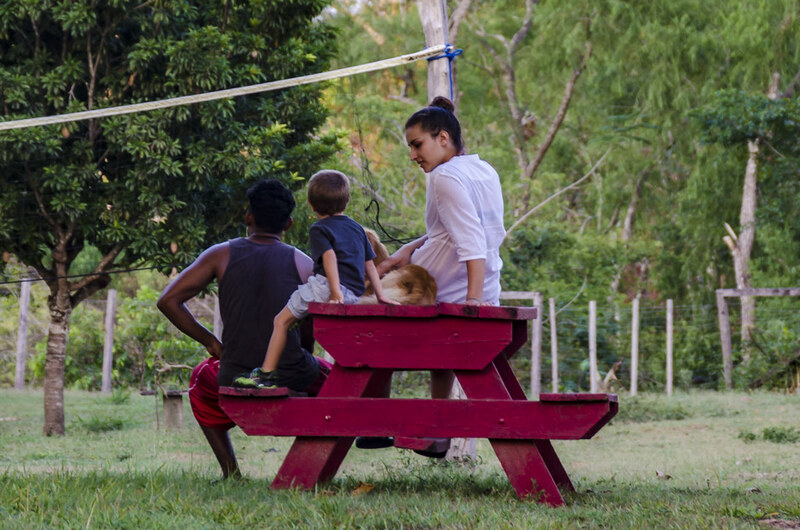 Although not part of the current school group at the campground, another traveling family with two boys joined us at the campground’s group dinner. We hit it off with Rachel and Sanjay immediately. 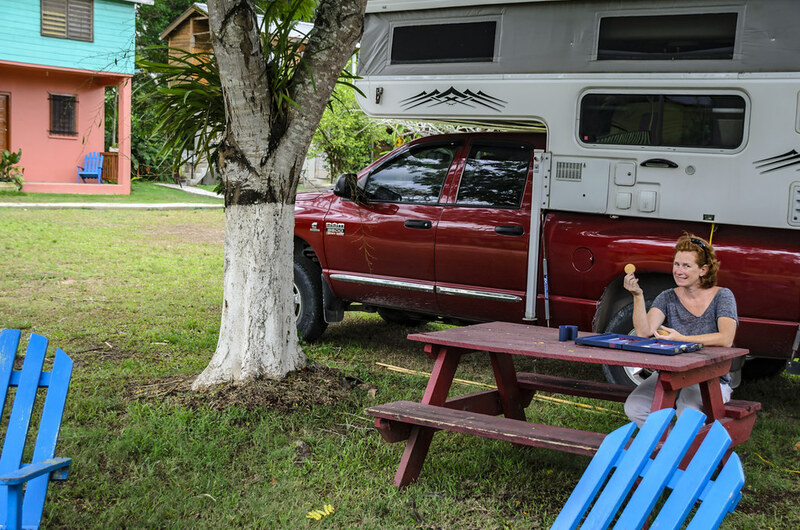 Rachel had entertained doing to a trip similar to ours and had many questions, and we gave them a quick tour of the camper and described some of our experiences. For some reason I really wanted Rachel to embark on a similar trip, I wanted another Mom out there on the road with me! She also reminded me of myself, from the freckled arms, growing up camping with family, and the desire for outdoor adventure. I was looking for my clan, and thought perhaps I found a sister member. 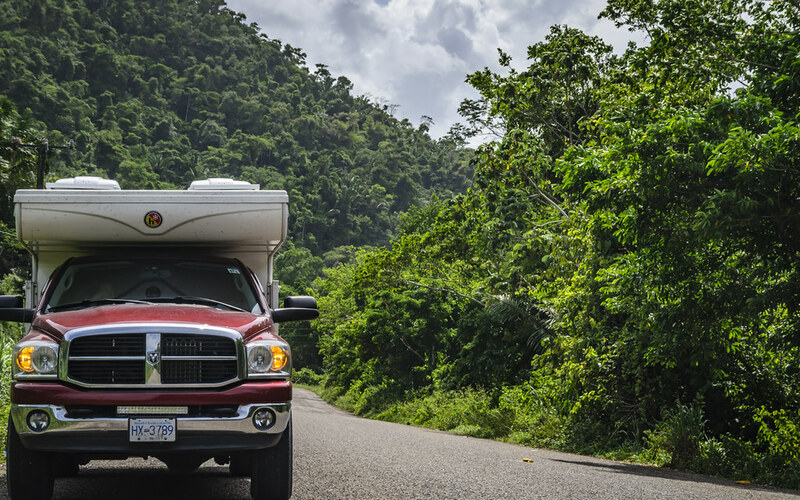 After looking at the tight space in the camper, Sanjay was not so sure they could manage such a venture. We assured them that the space constraint was one of our main concerns, and it turned out to be a non issue, but I don’t think Sanjay was convinced. 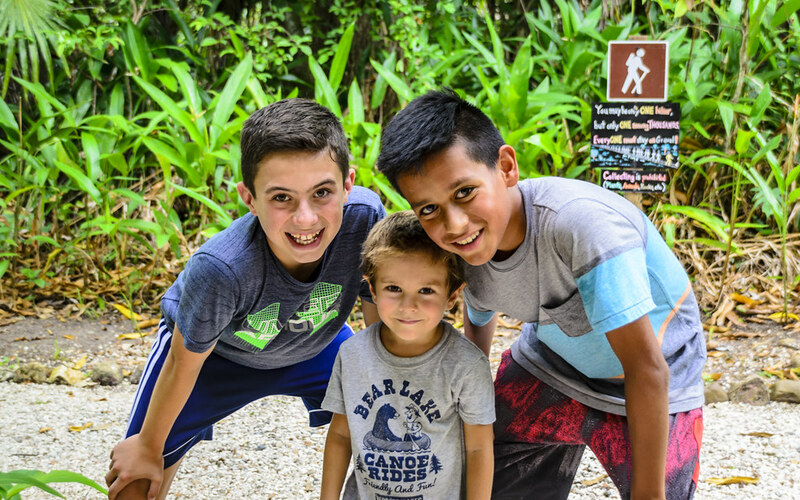 The Advani boys and Indigo became fast friends and ran around the beautiful campground, playing all sorts of games. Our mood was improving considerably here. No mosquitos, great campground, and wonderful people. So wonderful in fact, we decided our next destination would be Hopkins Beach where our new friends were headed, rather than a beach further south. 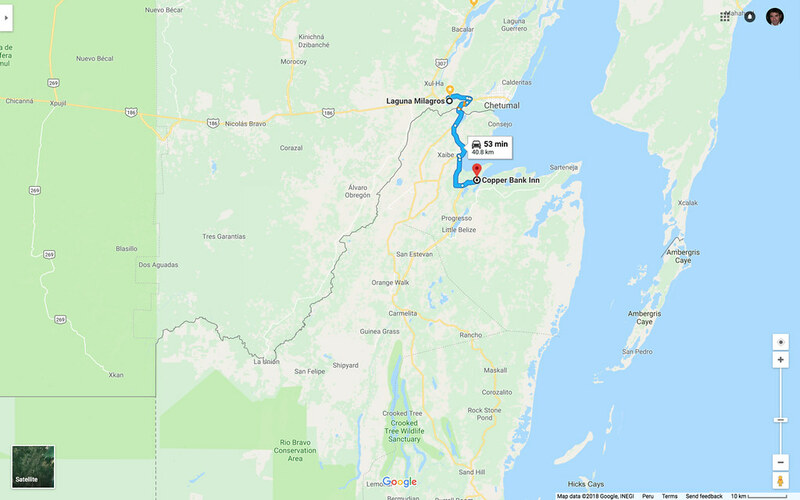 We used Google Maps to plan our route to the beach, and immediately ditched the route at first dirt road we encountered. We turned back and took the more traveled Hummingbird Highway. I was a bit bummed because I really wanted the dirt road, but I guess had I been driving this huge rig of ours, the lure of smoother sailing would have convinced me to turn back as well. 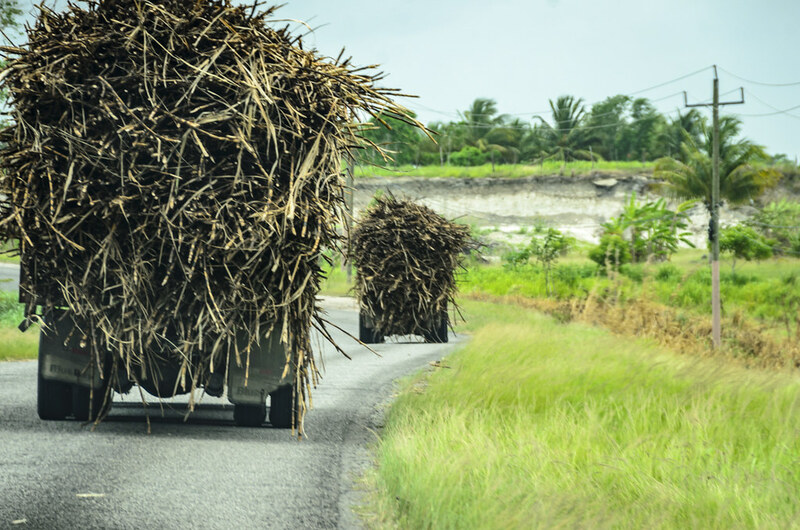 The scenery was lush and green along the highway, and we saw many oversized loads of sugar cane traveling along the same route. 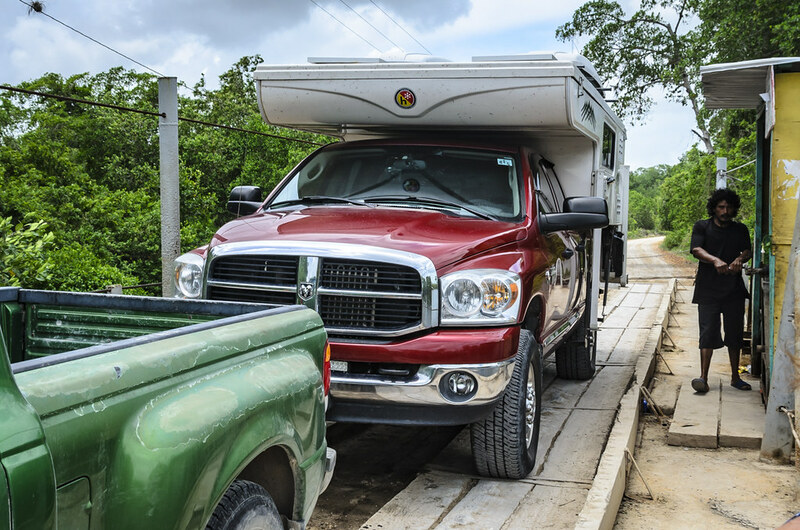 Then we turned off the smooth road into the bumpy driveway of our next campground. We stayed at Hopkins Beach Kismet Inn. 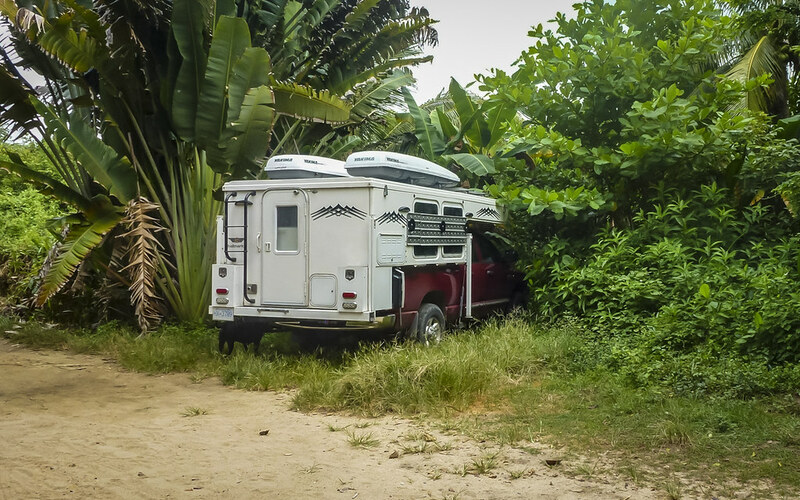 Our camping situation was very interesting…first time we pulled headlong into a patch of shrubbery for a campsite! The view out the bedroom windows was very green to say the least. 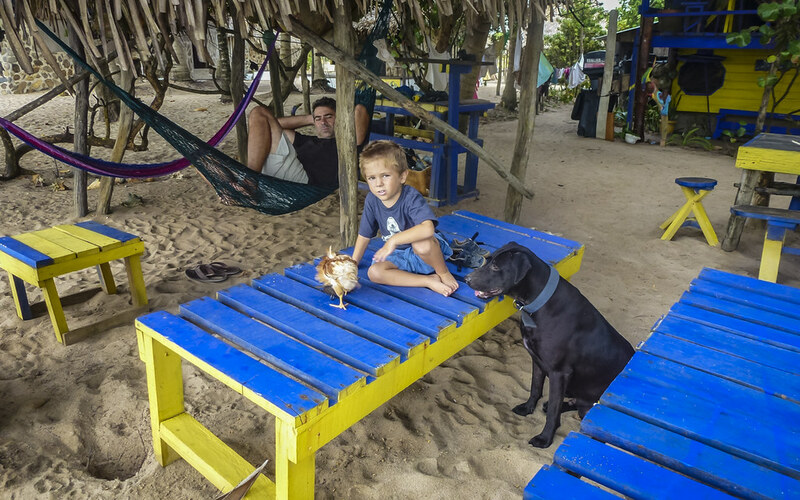 The campsite matched the vibe of the town, rather funky and laid back with an appreciation for the natural surroundings. 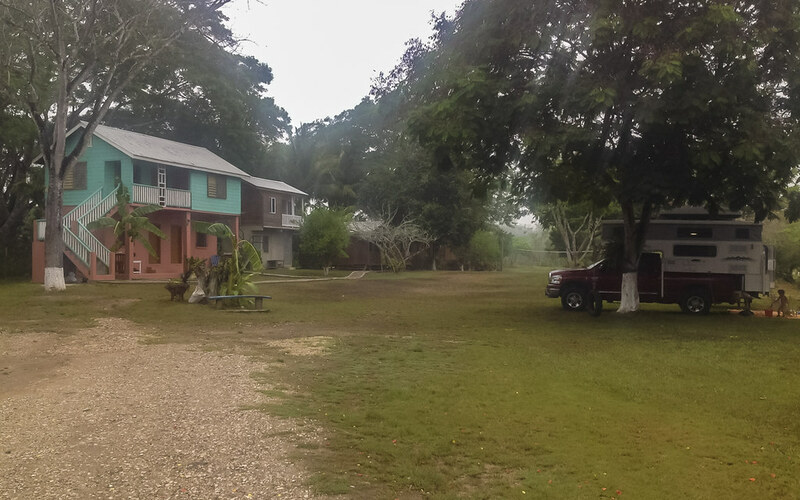 Hopkins Village is known for continuing the legacy of the culture and music of the Garifuna people, whose ancestors were brought to Belize by way of the Afro-Caribbean slave trade. The Lebeha Drumming Center is instrumental in keeping the culture alive in the community. The Kizmet Inn was very eco friendly, boasting compost toilets in stalls that were made of bamboo slats. This allowed lots of air to blow right over your bum, making you feel like you were still outside. I am all for composting, and feeling one with nature, but I was really hoping for a more enclosed bathroom during our stay. Perhaps it had something to do with the impact the current phase of the moon was having on me. The Advani’s had a lovely rental house just a block over, also along the beach (not sure how to measure blocks on a beach dotted with palms, but it felt like a block). Oh how I could see Sanjay’s wisdom of renting a beach house, rather than parking a truck camper into the bushes at this particular moment. We got to share a beer and hang out again with Rachel and Sanjay while the boys played along the beach, and in the surf. The water was quite rough, but Indigo was in good protective hands. Besides the companionship of the boys, Indigo spent large amounts of time with the resident dog and chickens. He was even featured on the Kismet Inn’s website for the week. 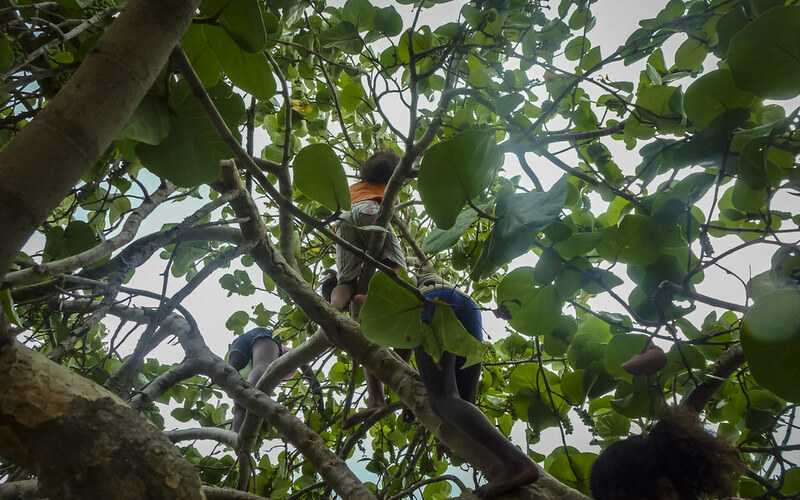 The neighbourhood kids we encountered on one of our walks, climbed into the tops of the trees, and came down with new fruits for us to try. They had to climb quite high and I had to hold Indigo back, as his climbing skills are not quite that advanced yet. Before leaving, we enjoyed a really great pizza at the Driftwood Beach Bar and Pizza Shack next door, which also allowed camping in their parking lot. I noticed that their bathrooms were quite nice too. 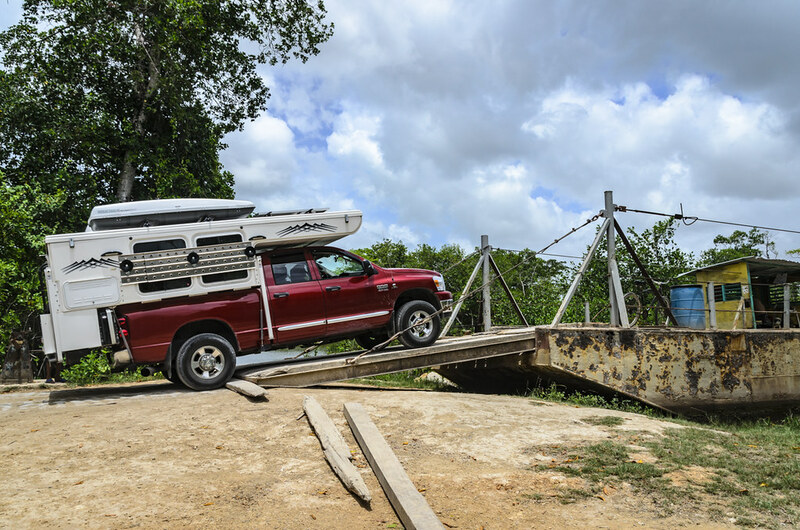 We headed for our last campsite in Belize which was just a stone’s throw from the Guatemala border in San Ignacio. 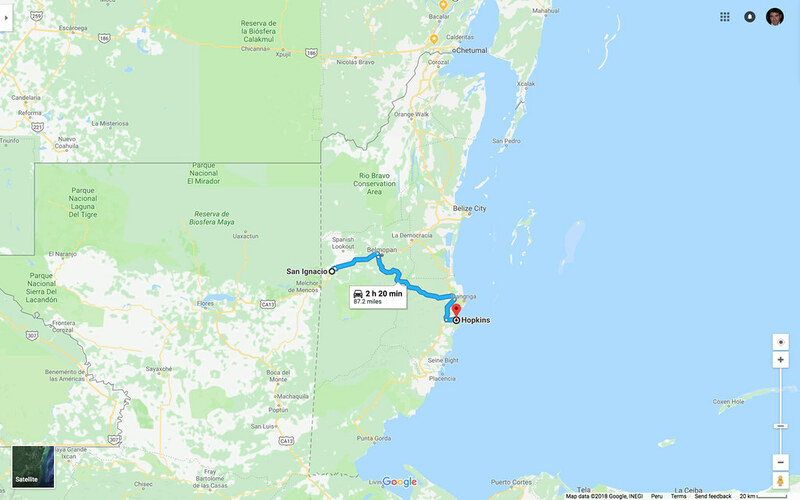 The drive there was easy, except we were surprised to hear the engine pulling so hard up hills, after only hearing the hum of the engine on the the flat smooth roads of the Mexican Yucatan. 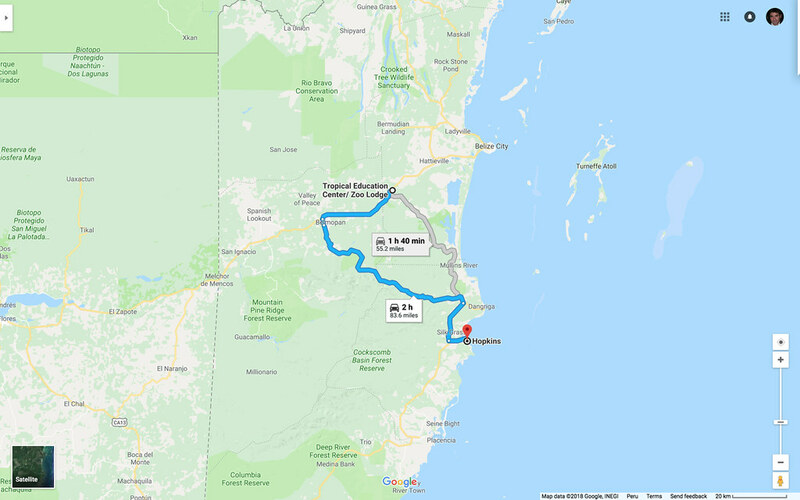 We also noticed we were much more calm driving around Belize than Mexico, perhaps because we never once saw a police car? We thought we’d spend one night prepping for the border (back when we prepped for borders) at the Mana Kai campsite. But we stayed for a long time fixing various things. We also started our first purge here. I think every Overlander hits a point on where they are tired of looking at the crap they brought, that they never use. We finally let go of the camping table we lugged in and out of the camper at each campsite, never to use it except for a way to block the pointy corner of the camper door so indigo didn’t bang his head. But we didn’t “really” get rid of it, we converted it into other things. Two of the legs are now used for an awning and the handle and other legs were converted into a stand for a portable solar panel. Our best campsites, have always been the ones in which me make friends. This was one of those places. The Quiroz family that runs the place were warm and welcoming. We were there the week the father officially retired and handed over the running of the campsite to his son and new wife. They are a young couple with a lot of energy and have plans to grow the family business. 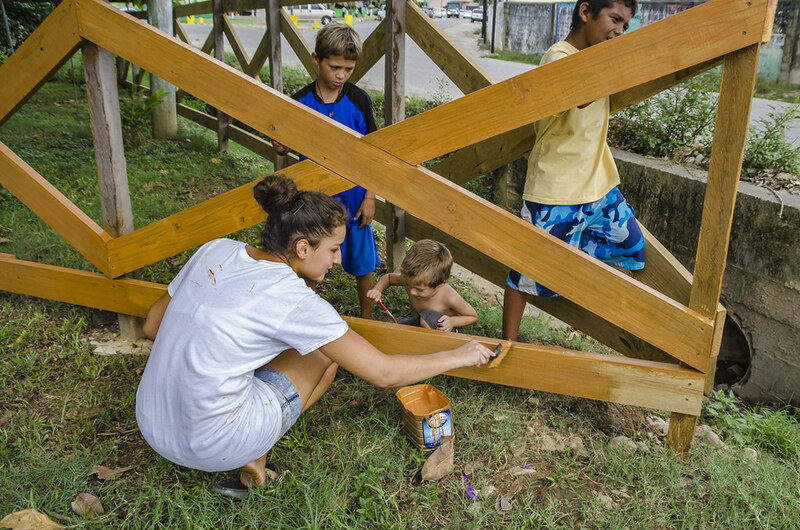 We decided to pitch in and help paint fences, and when not consulting the young couple on their next projects, Indigo played with the sons of the other workmen. Demri was Indigo’s favourite playmate, and I think the feeling was mutual. Demri taught Indigo about the fruits he could eat on the trees, and which ones he couldn’t, and took him swimming in the river while I watched from the bank. 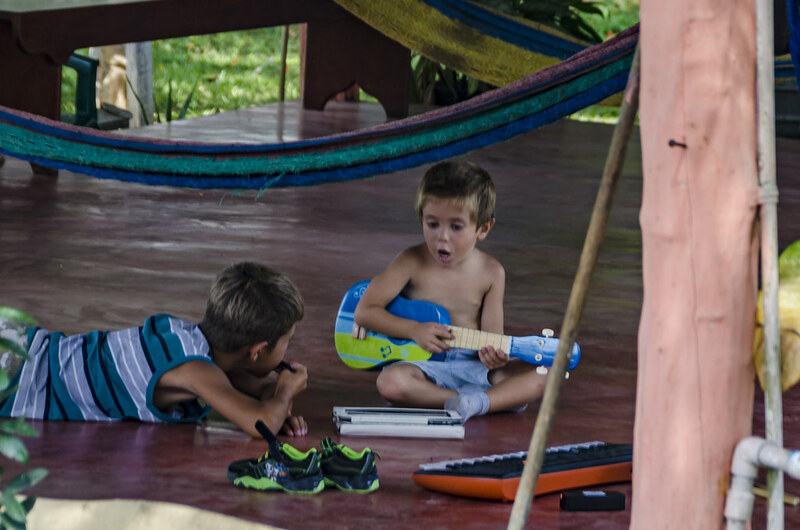 They even created a two-man band, and gave performances of Beatles and Michael Jackson songs to the other campers. The campsite was actually rather busy with student groups involved in the archaeological site nearby. It was entertaining to hear some kids on the phone with family back home saying how they were loving it, and other saying they were hating it. But regardless of their homesick status, they took turns at night telling Indigo spooky stories. 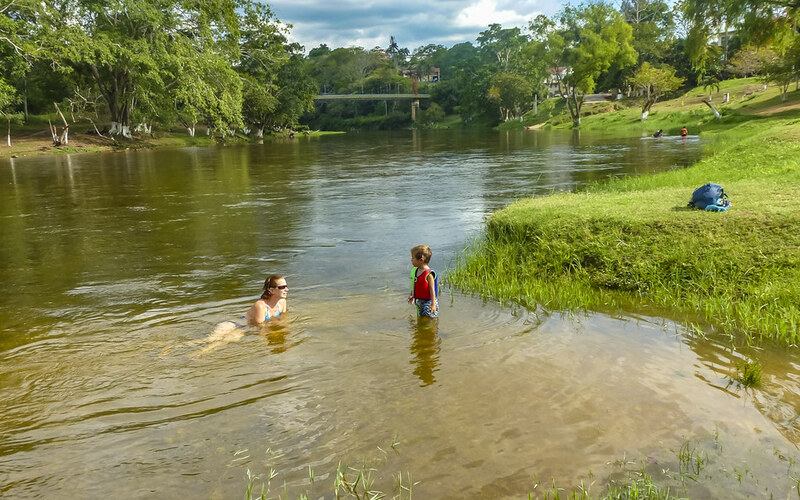 We went down to the river at the edge of town, people swimming, doing laundry, lounging. I was keenly aware of being the only one in a bathing suit. The young locals just jump into the water in their underwear. Otherwise people swam in shorts and tank tops. It was a beautiful scene along the river as there were always huge clouds, white and grey, puffy against a blue sky. Storm cloud would be whipped up every so often and dump rain, only to have the sky open up and let the sun through again. We were really enjoying our time here, and with every passing day, it got harder to leave. We were there so long that we even managed to see Rachel and Sanjay one last time on their way to Gautamala to see the Tikal ruins. By this time we felt like one of the family at the campsite and were very comfortable. With so many diversions for Indigo, Okan and I got spend time doing one of our favourite things…playing endless games of backgammon. I started another long losing streak here (they can last for days, sometimes weeks!). How can Okan get doubles on the last roll, to win the last three games? 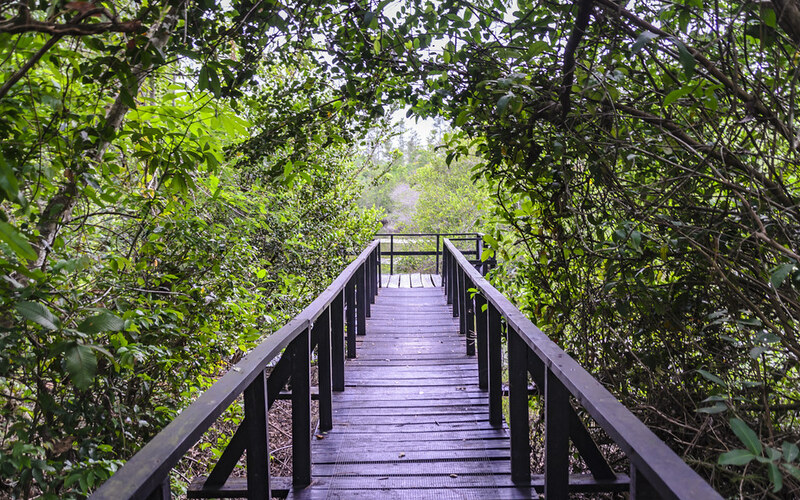 Now that we were becoming comfortable with Belize, I struggled with a desire to now stay and see more of the country. 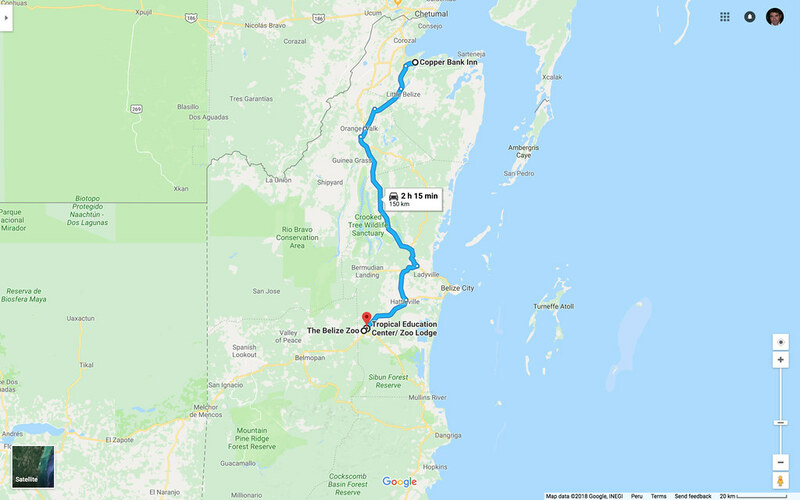 But, Belize is also very expensive and our budget motivated us to pack up and head to Guatamala. The ruins of Tikal were waiting for us, and we had to say our goodbyes. So with the first part of your post you must have thought about all the trips to Spikers farm to eggs. Going down the cool cement steps to the dirt floor with the small chalk board listing the price of the eggs. Then checking out the chicken coup. Oh and the Amis the son. Lona, absolutely thought of our days at the farm! And sneaking through the fields falling into cow pies on the way to school. I remember thinking “how rude” when people would try to take pictures of our Amish neighbours as if they were some sort of tourist attraction. And now…I find myself wanting to take photos of all the people wearing their traditional clothing in the countries we visit! I now understand the feeling! Thanks for another great report from road! Keep up on your blog! You’ll be thankful for it someday. … and I’m greedy to read more.